I will not Run Away Any More! I Will Not Sit Back Any More! I Will Not Take it Any More! Its Time to Fight Back! 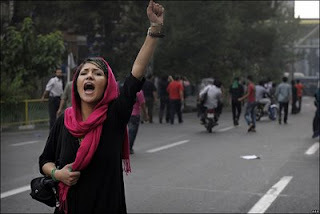 I truly hope the people of Iran will find the strength in their moment right now. I am old enough to remember 1979 as a kid in America. In my heart of hearts, I pray this is a truly a point in time where the current course changes direction. The cloud of darkness lifted, and these people find freedom. Many folks are pulling for you. hahaha..you are delusional, your candidate lost, get over it, and stop posting pictures of northern tehran protestors who are the rich young kids. Sasan or is it Hanif Leylabi? Are you hearing about the coup?? I can't get in touch with anybody in Iran. They are saying it's a coup - Mousavi, Khatami, Khatami's brother, and others are under arrest. Have you talked to anybody in Iran?? Are you receiving news by satellite on another planet? Of course it is a coup. More than 150 dissidents have been arrested including Ahmad ZeidAbadi and Mazrooeii. Moussavi is under house arrest. You know you always went on about Mossadegh and 1953 coup, well that was 56 years ago and the same people who are in power now helped to topple Mossadegh. Now there is a coup in your life time right now. Hope you will do something about it. mitooni baghiye link hA ro az facebook hA vardAri. post hA ro chek kon. bebakhshid fekr konam =share o bA =mf bAyad avaz koni. نيروهاي لباس شخصي مجهز به اسلحههاي سرد كه بيسيم با خود به همراه دارند با استقرار در برابر درب روزنامه اعتمادملي متعلق به مهدي كروبي يكي از نامزدهاي معترض به نتايج اعلام شده، از رفت و آمد عابران از برابر اين روزنامه و همچنين خروج روزنامهنگاران و كارمندان اين نشريه جلوگيري بعمل ميآوردند. In my humble opinion, the "Coup/green revolution) is turning into a dumb, lame theatrics. The elections and the debate circus has been a testament to what people already have known for 30 years and an insult to the Iranian's intelligence. The media is trying to turn Mousvi into a hero despite his criminal record during his premiership. Ahmadinejad in answer to Christian Amanpour already compared the elections to a football match, and simply described some players and fans who break traffic rules after the match. The fact is that both sides know for sure without the core of the establishment their 30 years ride is going to be over, it takes two to tango. People are pissed off, but not because they prefer Mousavi or hate Ahmadinejad, they know either way the temporary lifting of restrictions will be over and it will be back to business as usual. Things will not really change unless people demand radical and fundamental change which they are willing to make risks for. Otherwise the protests will fizzle out by repression and necessity, and the establishment will rule on under a slightly different mask. Sasan, I live in eastern Tehran, hardly a rich district, and I'm hearing the chants of "Allah-o-Akbar" and "Death to Dictator" from all around me --on the roofs, in the houses. I bet you are hearing them, too, wherever you are. So who is delusional? The coup has been against khamenei and the clerics. They are saying that he is no longer the man in charge, but he was preserved as a figurehead. The real man in charge now is Ahmadinejad - supported by the IRGC (sepah) network. Dont worry about 'Sasan'. I am sure he is not even Iranian as Sasan should be writeen Sassan. One thing I am sure of however is that he is a complete coward, he cant even have a real profile. SO yes I agree with Nadir very probably Sasan is an English SWP wanker. School boy opinion as usual. Dude, get over yourself. This is not my opinion, this is the news coming out of Iran. Get over your obsession with Haleh and open your mind. Again, this is not my opinion. There is no need to be combative with me at this moment. I am trying to figure out what is going on. "There has been a coup. Ahmedinejad and the security services have taken over. The Supreme Leader has been preserved as a figurehead, but the structures of clerical rule have effectively been gutted and are being replaced by a National Security State. Reports that facebook, twitter, text messaging and foreign TV broadcasts have been blocked, that foreign journalists are being expelled and that large concrete roadblocks (the kind that require a crane to move) have appeared in front of the Interior Ministry all feed a sense that what we are now seeing was pre-planned. Underlying this is the theory that Ahmedinejad and the people around him represent a new generation of Iranian leadership. He and his colleagues were young revolutionaries in 1979. Now in their 50s they have built careers inside the Revolutionary Guard and the other security services. They may be committed to the Islamic Republic as a concept, but they are not part of its clerical aristocracy and are now moving to push the clerics into an essentially ceremonial role. This theory in particular seems to be gaining credibility rapidly among professional Iran-watchers outside of the country." "On the basis of what we know so far, here is the sequence of events starting on the afternoon of election day, Friday, June 12. * Shortly thereafter, all mobile phones, Facebook, and other social networks were blocked, as well as major foreign news sources. All of this had the appearance of a well orchestrated strike intended to take its opponents by surprise – the classic definition of a coup. Curiously, this was not a coup of an outside group against the ruling elite; it was a coup of the ruling elite against its own people." The nest time you decide to make a sarcastic comment like "what planet are you getting your news from" or whatever you said, please understand what a coup is before you say, "of course it's a coup." Things are happening and don't presume to think you know what they are. And I saw that ridiculous channel 4 interview - you said nothing of substance and came off as "school boy" in front of a bright academic. See, you always tried to persuade us that you too want change. But listen to your tone. It doesn't reflect any solidarity or comradery at this critical moment. Are you willing to stand by that kind of opinion when you've probably heard what the students have been screaming? i.e. the exact opposite! If you aren't, you are a coward indeed. This is eh end! 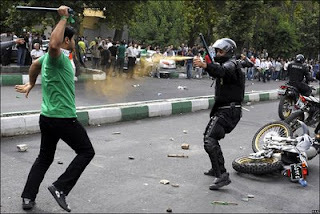 Zendebad IRAN Death to The Islamic Facist Republic!! I agree with Trita Parsi. You're just to shallow minded to understand why. Call it cowardice - I call you retarded. p.s. You have no reason to attack me right now, but you chose to and I responded in kind. Try to open your mind, then maybe you can understand what Trita is trying to accomplish instead of calling him names - is that just a natural right-wing reflex? I guess when logic isn't on your side you just start hurling names and accusations. Palin 2012.